On the heels of another damning report on the role of systemic pesticides in bee die-offs, Ontario’s Agriculture Minister proposes restrictions on the use of neonicotinoids. The Organic Council of Ontario applauds Ontario Minister of Agriculture Jeff Leal’s leadership in moving toward restrictions on use of Neonicotinoid-based pesticides as a good first step to save pollinators such as bees and protect Ontario’s food supply. 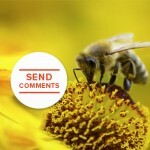 In late June, the Task Force on Systemic Pesticides, a group of 50 scientists from around the world, released a study of the literature about the long-term impact of neonicotinoids and concluded they should be banned. “Restricting neonicotinoids will help ensure that Ontario’s food system is secure as 1/3 of our food relies on pollinators who’ve suffered massive die-offs directly linked to use of Neonicotinoids,” says Organic Council chair and producer representative, Jenn Pfenning. Ontario could impose an outright ban on sales of neonicotinoids, which first came into widespread use in the 1990s. However, up to 100% of conventional corn and canola and 80% of soy grown in Ontario now use neonicotinoids. Therefore, phasing in restrictions is a more balanced approach to support growers to use more effective pest control tools such as Integrated Pest Management. Ontario Ministry of Agriculture, Food and Rural Affairs Crop Specialists have called attention to the unwarranted prophylactic use of neonicotinoids on Ontario crops and question their benefit on any more than 10% to 20% of corn and soy acreage. Pesticides are not designed to be used as preventative treatment and yet they are being applied and sold indiscriminately without monitoring the fields in question. “While some have suggested that without neonicotiods farmers will be forced to rely on other toxic chemicals, organic farmers are able to produce crops with high yields without the use of synthetic pesticides and have a strong system that works for farmers to ensure effective and safe use of pest management tools.” adds Ms. Pfenning. The Organic Council supports the balanced approach for the 2015 growing season brought forward by Minister Leal to protect both pollinators and growers in Ontario. The Organic Council of Ontario (OCO) is the Voice of Organics in Ontario. 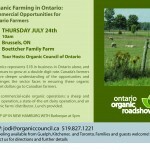 OCO was founded by the organic sector to serve the Ontario organic business and farming community. 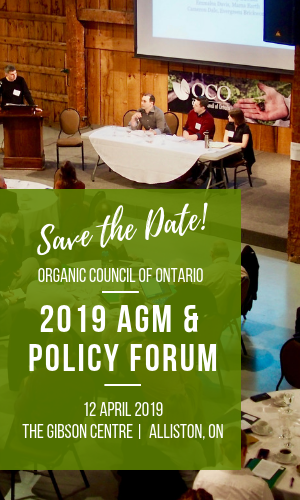 OCO is a membership-based non-profit association, working to shift Ontario towards more sustaining and organic agriculture through advocacy, market development, research & training, and by educating government policy makers and the public on the full value of organic agriculture.